The ability to attract, as well as retain, your ideal employee is integral to your business. Attracting that individual can be very competitive and in today’s modern mobile climate, one of the best ways to compete is to create a strong social employer brand. Each social platform has its own unique benefit to your employer brand. You should first and foremost understand what they are. Facebook is the most used social media platform in the world and is a great place to start. Potential candidates, especially millennials, will definitely be going on your Facebook page as one of their first assessments of your business to see what your follower base is like, and what photos and videos you have to show off. They will also go to your page to find out your contact information, your location and to see any reviews you have received from clients. So be sure to keep it constantly updated. Twitter is more of a place for communication and engagement. For example, you could use twitter to share relevant trends, and retweet quotes from key industry influencers and stakeholders. Instagram is your platform to tell stories, a topic we will delve into later on in this piece. Use Instagram to share pictures and videos about your employees, your achievements and the events you attend. It’s a behind the scenes look into your business that offers real transparency and authenticity. LinkedIn is your brand’s professional social presence, and is a great place to reach out to, and identify, potential candidates. There are more social platforms that I might have ignored such as Pinterest, Google+ and more that are important to your business and the image you want to communicate. So just continue to evaluate, improve and develop your strategy on the platforms you want to use and make sure you are utilizing the distinct capabilities of each platform to the best of your abilities. 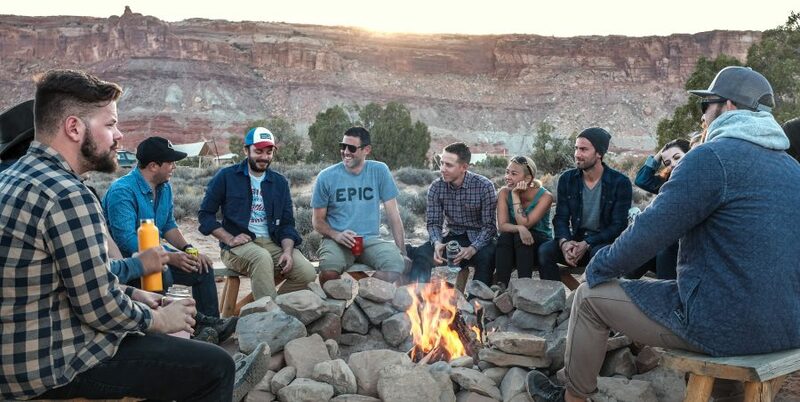 There really is nothing more authentic than employee advocacy when it comes to promoting your social employer brand. Enable your employees to share information about your brand on relevant social platforms. Allow them to post, share and like industry relevant information that intrigues them. Potential candidates want to see what type of employee is at your company. They want to know if they match the type of person they want to work with, and what they should expect if they were to join you. Dell has a social media training program for over 10,000 employees, in order to help them engage their online community and post brand-related content. Along with their great company culture, employees feel happy to post about the company, as seen below. Use social media platforms to tell a story about your employer brand. Your candidates want to know more than what they just read. They want to see your brand and get a real feel for your business. At the same time, your current employees want to feel they are a part of your story and that each individual person means something to your brand. Be sure to be sharing photos of company events, funny videos at the office and pictures of your employees. Platforms like Instagram, Facebook and Twitter are great places to do exactly that. Your candidates will enjoy the transparency, in terms of the day-to-day culture currently being offered at your brand. Employer review sites have become extremely important for potential candidates to get a real understanding of a brand’s management style, benefits system, workplace culture and much more. These reviews are trusted among candidates and employees because of their anonymity and un-forceful nature. Leaving a review is voluntary and reviews are an authentic overview of a business’ employer brand. So be sure to be reviewing these sites as much as possible. 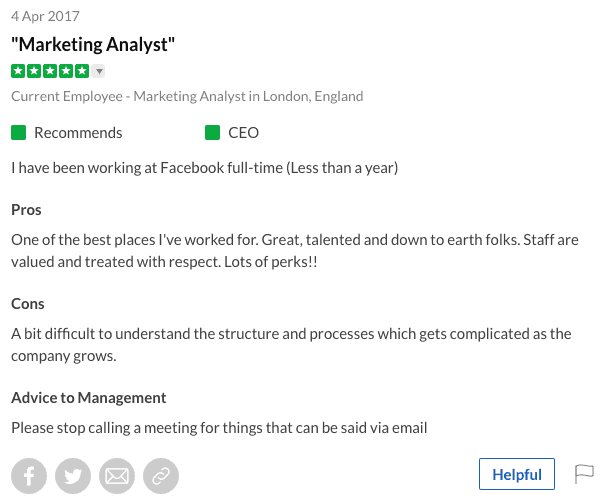 Dedicated review sites like Glassdoor, Great Place to Work, and even Indeed are useful places for you to get a real understanding of how employees and former employees are communicating your employer brand. Does your employer brand, and the value proposition you offer, line up with what reviews are saying online? Does the work culture you think you have actually line up the work culture your employees are communicating online? This Facebook employee enjoys the staff culture but is confused by the organizational structure. So an employer brand manager can use this information to improve the clarity of Facebook’s organizational structure by reminding their employees what their responsibilities are and who they report to. Organizational structure is extremely important in large organizations like Facebook, and by just going on a review site like Glassdoor, you can make some very important changes to your business. Employer review sites are an integral place for you to continuously audit your employer brand; in terms of what you’re doing right and more importantly, what you’re doing wrong, so that you can continue to improve. Lastly, don’t be ashamed to evaluate what your competitors are doing. Use it to benchmark your social employer brand in concurrence with what others are doing. If a competitor is getting more likes or more retweets on a post, try to understand why. Why are they getting more engagement than us? How often are they posting? What type of content are they posting? Essentially, what are they doing right and what are you doing wrong. Create a social strategy based on this information and use it to develop your social brand. Competition is healthy what ever way you want to put it, and assessing your competitions social media efforts regularly is a great place to stay ahead of them. Let us know your tips to staying on top of your social brand, how you keep your social presence fresh enough to retain and recruit the best talent for your business.